Behind the Scenes Tour – Explore behind the scenes of the Aquarium, visit the tops of the tanks and see what our Biologist team gets up to. Snorkel Safari – Plunge beneath the waves and explore the fantastic sea creatures we have living on our very own doorstep. Never snorkelled before? We’ll teach you how! Beach Fun – After the excitement of snorkelling, we’ll have chill out with a mini bbq, play some beach games, explore the rockpools or just splash around in the waves. Sustainable Seafood Cooking – With help from our chefs, we’ll create a fantastic fishy dish for you to try. All the fish is locally caught and sustainable. Engineering Challenge – Work together as a team to see if you can raise the shark by creating a hoist! Who will be the fastest team? Sail on the Sound – We’ll be hopping on a boat and going for an explore around the Plymouth coastline. So many great things to see. Conservation Video Planning – Time to release your passion of the marine environment by planning and starring in your very own conservation video. What message do you want the world to hear? Conservation Production – Lights, camera, action! We’ll turn all that hard work into a video to show off to the world! Friends and Family Afternoon – Time to show off everything you’ve done and all you know! Competitions, quizzes and prizes to be won! 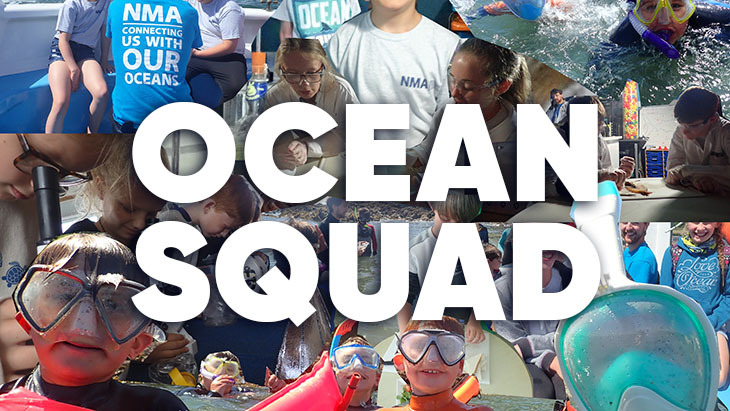 If you think this sounds like something your Ocean enthused teen might love why not book them onto one of our Ocean Squads? Places are just £115.00 per person and come with a t shirt, a usb stick of photos and videos from the week plus a year pass to the National Marine Aquarium.